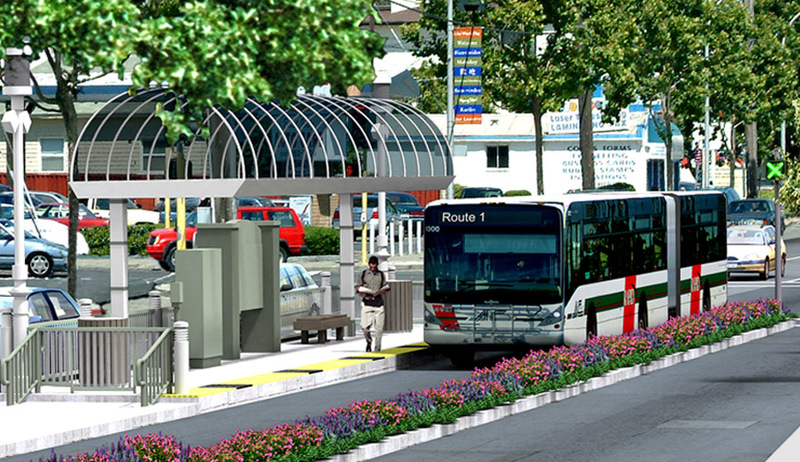 This $174-million Bus Rapid Transit (BRT) project will construct 33 rail-like, raised-platform stations and dedicated bus lanes along 80% of the 9.5-mile International Boulevard corridor, connecting the Uptown Transit Center in Oakland and the San Leandro BART station. Elements of the project include off-board fare payment, level passenger boarding, safety and security features, pedestrian access improvements, modification or installation of 125 traffic signals, and the installation of a new transit signal priority system. CHS Consulting Group is part of the team for preliminary engineering, final design, bid and award support, and design services during construction for this project. CHS worked with AC Transit and representatives from the Cities of Oakland and San Leandro in the Maintenance-of-Traffic design for advanced utility relocation and project construction, and signing and striping for the entire 9.5-mile corridor. Tasks included refinement of BRT station locations, pedestrian access to the stations, temporary relocation of bus stops, and traffic detours during the construction period. CHS submitted 100% RTL Plans in September, 2015, meeting the project schedule, and subsequently completed a Plan Addendum. Prior to joining CHS Consulting Group, Bill Lieberman was a Transit Planning Advisor to AC Transit reviewing design and operating plans and recommending funding and implementation strategies.